The PM Kindergarten class at Plymouth Creek Elementary School got off to a slow start due to a transportation hiccup Wednesday, Sept. 7. 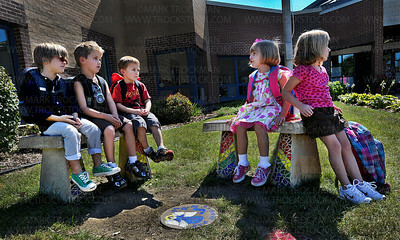 Seated on mosaic-enhanced concrete benches in front of the school are, left to right, Bartlett Howe, Brandon Turner Nutter, Alex Koeller, Sydney Olsen, and Ellie R.
Student Alex Koeller, right, gets a hug and a kiss from his mom, Jean, on the first day of class for Plymouth Creek Elementary School's Kindergarteners Wednesday, Sept. 7, 2011. 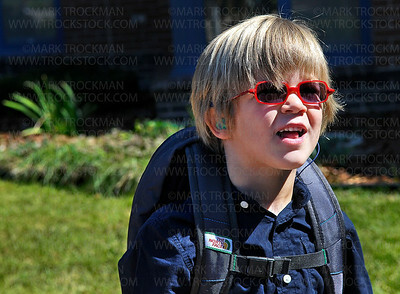 Plymouth Creek Elementary School student Bartlett Howe waits in the afternoon sunlight while his PM Kindergarten class slowly comes together after a transportation snafu delayed the start of the first day of classes for nearly 40 youngsters Wednesday, Sept. 7, 2011. 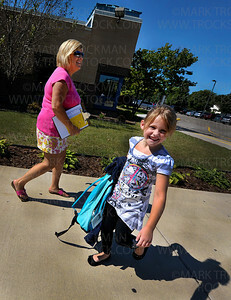 Lily Regensburger, right, is the first PM Kindergarten student to arrive on the first day of classes Wednesday, Sept, 7, at Plymouth Creek Elementary School. Lily's teacher, Jane Johnson, begins the slow process of gathering her students as they arrive, a few at a time, getting to school with parents and family friends due to a late bus. PM Kindergarten teacher Jane Johnson leads several of her students into the building at Plymouth Creek Elementary Wednesday, Sept, 7, 2011. 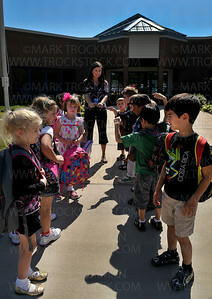 The first day of school for the PM kindergarten students and teachers had a slow start due to a transportation hiccup. 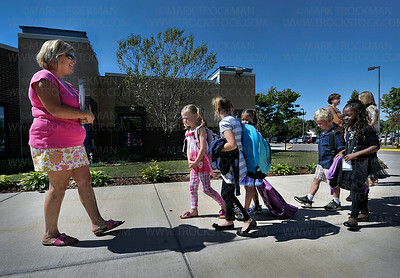 Students exit their school bus for the first day of classes at Highland Middle School Tuesday, Sept. 5, in New Brighton. 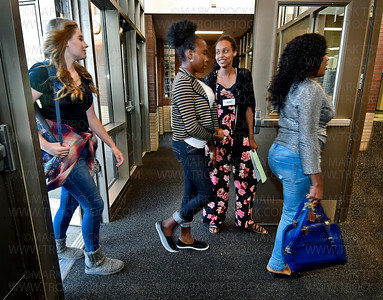 8th grader Safa Madar, 2nd from the right, greets student as they enter Highland Middle School on the first day of classes Tuesday, Sept. 5, in New Brighton. Left to right, Tayshaun Boyd, Samuel Lopez and Jordan Johnson study their schedules on the first day of classes at Highland Middle School Tuesday, Sept. 5, in New Brighton. 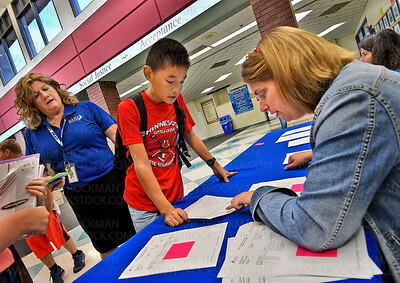 8th grader Derek Wang, center, gets help figuring out his schedule from math coach Jessica Breur, right, while school principal Sheila Eller, in blue, looks on at Highland Middle School Tuesday, Sept. 5, in New Brighton. 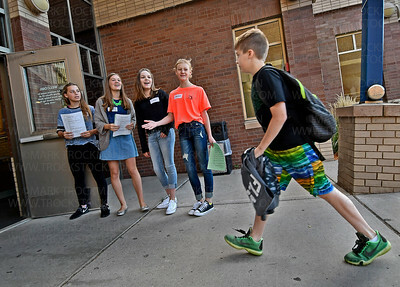 8th grade greeters welcome a student to Highland Middle School on the first day of classes Tuesday, Sept. 5, in New Brighton. 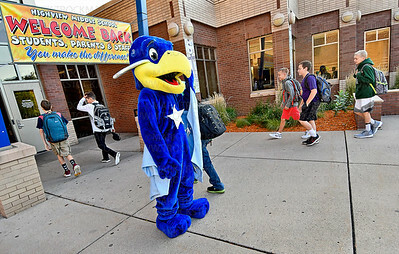 The Highland Middle School Hawk welcomes students as they disembark from their busses on the first day of classes Tuesday, Sept. 5, in New Brighton. 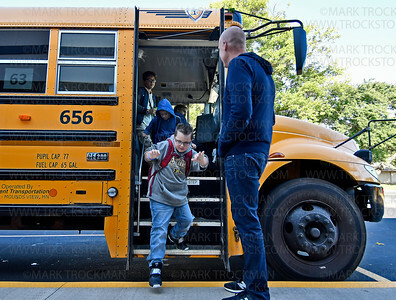 A young students exits his bus on the first day of classes at Pinewood Elementary School Tuesday, Sept. 5, in Mounds View. 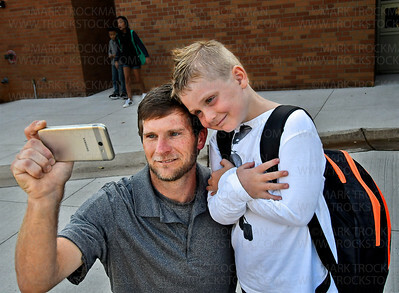 First grader Asher Bowles and his dad, Curt, stop for a 1st day of school self portrait outside Pinewood Elementary School Tuesday, Sept. 5, in Mounds View. Pinewood Elementary students crowd the sidewalk after getting off their busses on the first day of classes Tuesday, Sept. 5, in Mounds View. 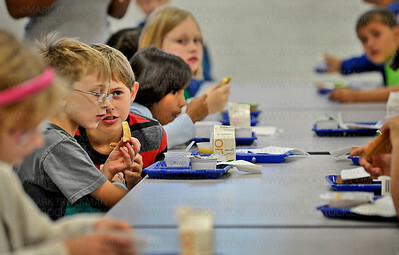 Pinewood Elementary School students begin the 1st day of school with a tasty breakfast Tuesday, Sept. 5, in Mounds View. 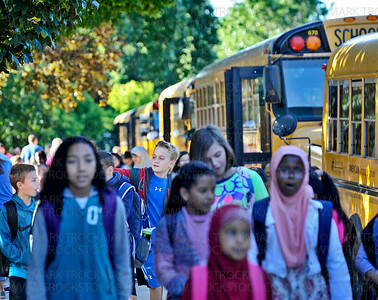 5th grader Liam Donahoe, 11, enjoys the early morning sunshine on the first day of classes at Pinewood Elementary School Tuesday, Sept. 5, in Mounds View. 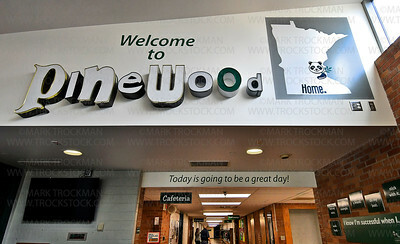 Signs of school pride greet all who enter Pinewood Elementary on the first day of classes Tuesday, Sept. 5, in Mounds View. 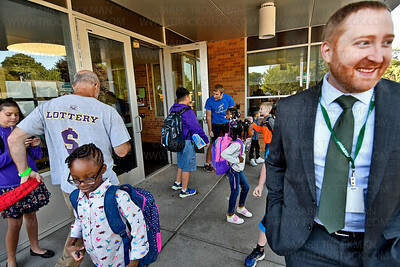 Principal Andrew Skinner, right, welcomes students and staff on the first day of classes at Pinewood Elementary School Tuesday, Sept. 5, in Mounds View. 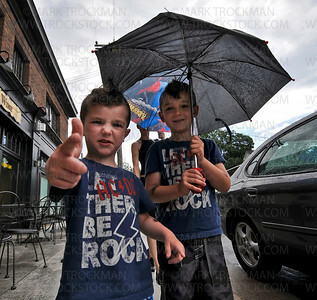 Brothers Nate, left, and Ian Crane sport matching tee-shirts and 4th of July mohawk haircuts under their Spiderman umbrella during an afternoon rain shower in downtown Excelsior Saturday. 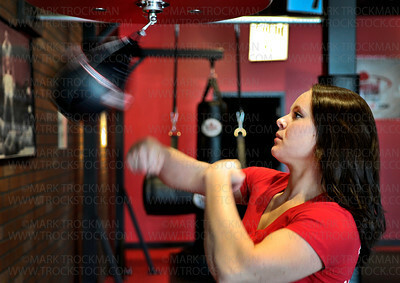 9Round 30 Min Kickbox Fitness manager Grace Witthuhn slams a heavy bag with a sidekick at the gym Friday, April 18, in Plymouth. 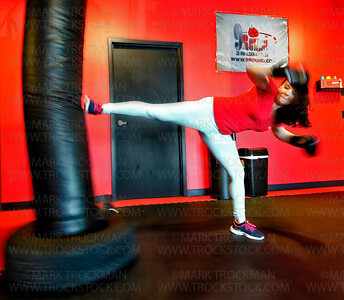 9Round 30 Min Kickbox Fitness manager Grace Witthuhn gets into the rhythm working the speed bag at the alternative gym Friday, April 18, in Plymouth.